The hard disk drive is usually largest data storage device in a computer. It is constructed of a stack of metal disks, sometimes called platters, that have a magnetic surface upon which data can be stored and retrieved. Tracks are concentric bands run out from the center of the disk are organized by radial divisions, called sectors, shaped like pie slices. 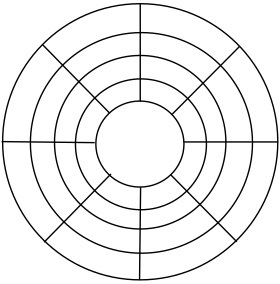 Areas of the surface of a disk are defined by the track and sector. As the disk platters spin under the drives read/write head, an electromagnet would turn on and off to magnetize spots on the disc's surface in a direction that indicates the value of the stored bit. The same number of bits is recorded in each sector. 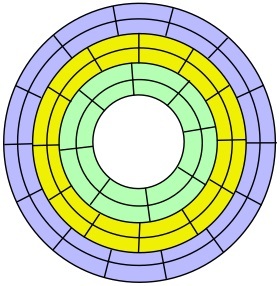 Since the inner sectors have shorter tracks, this means the innermost sectors are more densely packed with data than the bigger outer sectors. The innermost sectors were packed as densely with data as technology would allow, and since each sector had to have the same amount of data, space in the bigger outer sectors was wasted. To optimize utilization of platter space, ZBR divides it into different zones based on the track's distance from the center. Because the outer tracks are bigger, they are divided into more sectors than the inner tracks. This allows the entire surface of the disc to be packed closer to the capability of the technology. With longitudinal recording, as the disk spun under the read/write head, an electromagnet would turn on and off to magnetize the disc's surface so their magnetic fields would all line up in the direction the disc was turning. To create different bits, the magnet would reverse its polarity. Instead of the fields lying down in the direction the disc was turning, with PMR the write head plunged the magnetic recording field deep into the disc to create fields that are vertical allowing higher data density. A conventional hard drive has two heads, one for writing and one for reading. The write head is larger than the read head. This means that the tracks on a hard drive platter have to be wider than necessary for reading. There is also a guard space between tracks so that the write head doesn't disturb data on neighboring tracks.